We don’t realise how lucky we are to have clean, warm and functioning toilets. We take them for granted. but around the world there are millions of people who are not so lucky. This was brought home last year when Jane and Chris visited Cambodia for a volunteering holiday. Chris was part of a team, organised by Wearebamboo, who built a toilet, literally from the ground up, in a village outside Siem Reap. It was their first toilet and it was fantastic to have helped bring a bit of much-needed sanitation to its families. So when we heard of a toilet-twinning initiative we thought it would be a perfect way to put some of the money we have raised to good use. 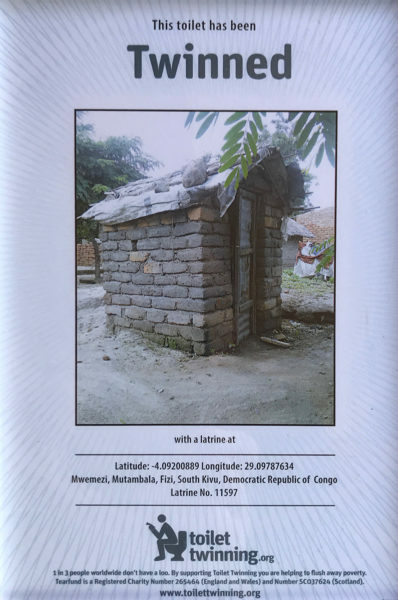 Our donation will help to pay for the upkeep of this particular toilet in the Democratic Republic of Congo.